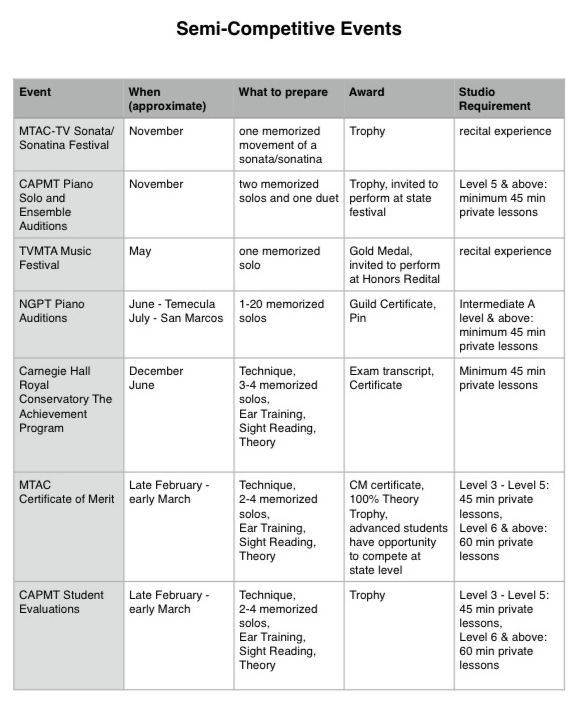 Students in my studio have a wide selection of opportunities to participate in various music performance, assessment, and competitive events. These can generally be divided into three categories: non-competitive, semi-competitive, and competitive. Each month in the studio newsletters, I will remind students to register for upcoming events, with more details on date, cost, who should participate, and required work. These include the studio recitals, which are held twice yearly, as well as the recitals organized by the local music teachers associations throughout the year. All students are encouraged to participate in these. Students gain valuable performance experience, as well as learn from observing other students. These include assessment/audition type opportunities, where students are evaluated by a professional adjudicator. They are judged against a standard of excellence, and are not being compared to other students. Students may usually enter these events at their current level, regardless of age. Therefore, an older beginner student may choose to perform an easy piece, while a younger student may choose to perform a more difficult piece, and both may receive high ratings, according to standards expected of the piece they choose to perform, not the average level of accomplishment expected of their age. Some of these events are “encouraging” in nature, while others have state/nationwide standards. It is beneficial for students to try different events by different organizations, so they get a balanced feedback of their abilities. These include local, statewide, national, and international competitions. 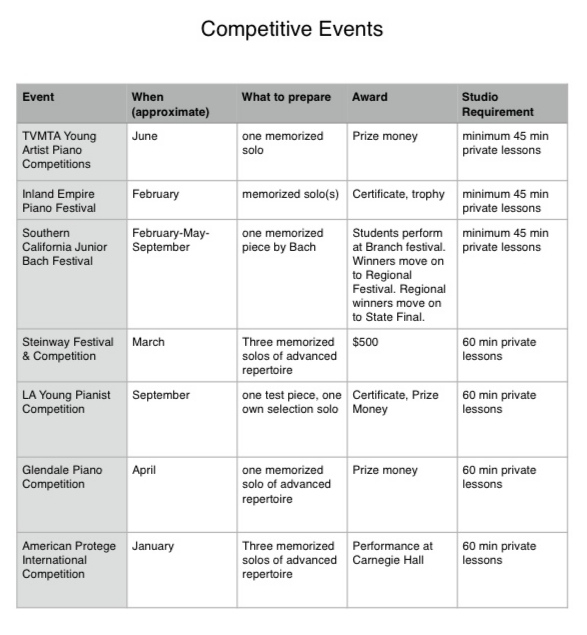 Students interested in competitions should have plenty recital and audition experience. Competitions outside of Temecula Valley are extremely competitive, and are recommended for highly dedicated students. To view or print this page as a PDF file, click here.